Corey D. B. Walker is Assistant Professor of Africana Studies at Brown University, author of the forthcoming book, Between Transcendence and History: Theology, Critical Theory, and the Politics of Liberation. He is a member of the National Political Committee of the Democratic Socialists of America. 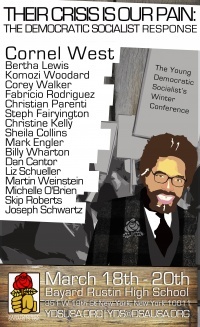 The Young Democratic Socialists’ winter conference, cosponsored by the Columbia University Working Families Party chapter, was held February 17-19 2006, in New York City. It was entitled "Turning the Tide Towards Freedom: Building the Youth and Student Movement for Justice." On the heels of a strong Young Democratic Socialists turnout at DSA’s 2007 national convention, its winter outreach conference’s success represents another stepping stone for a revived YDS. The conference title, “Be Realistic, Demand the Impossible: Reviving Democratic, Socialist, and Youth Activism,” honored the spirit of the young radicals of 1968 and reflected similar hopes and dreams that continue to motivate young activists forty years later. Saturday’s opening plenary, “The Struggle for Racial Justice Under Capitalism,” moderated by YDS Anti-Racism Coordinator Emahunn Campbell, featured Columbia University professor Manning Marable, immigrant rights organizer Monami Maulik, and DSA National Political Committee member and Brown University Professor of Africana Studies Corey D.B. Walker. The speakers addressed the need to connect the struggle for socialism to the fight against racism. Marable analyzed how the origins of capitalism depended on racist ideology; he further contended that a prerequisite for the elimination of racism would be the abolition of capitalism. US delegates to the Socialist International 13th Congress, Athens, Greece June 30th 2008 included Carol Browner, a delegation from Democratic Socialists of America; Frank Llewellyn, Corey Walker, George Roberts, David Duhalde and Alejandro Duhalde plus another DSA member Andrew Hammer attending with the International League of Religious Socialists, former New American Movement radical Jeremy Rifkin representing the Foundation on Economic Trends and Puerto Rican Independence Party, Ruben Berrios Martinez and Maria Jose Cisneros. On the weekend of March 18th-20th, 2011, the Young Democratic Socialists held their annual Winter outreach conference "Their Crisis, Our Pain: The Democratic Socialist Response to the Great Recession". Cornel West "will be the featured speaker on Saturday the 19th, and we will also host John Nichols, Bertha Lewis, Mark Engler, and Dan Cantor from the Working Families Party. Other listed speakers included Komozi Woodard, Corey Walker, Fabricio Rodriguez, Christian Parenti, Stephanie Fairyington, Christine Kelly, Sheila Collins, Billy Wharton, Liz Shuler, Martin Weinstein, Michelle O'Brien, Skip Roberts, Joseph Schwartz. Panels on race, the environment, organizing, and other topics will allow participants to learn from and communicate with fellow activists on some of the most important domestic and international issues. The event is perfect for both newcomers to Democratic Socialism/YDS, as well as activist veterans. Add your name to the list here and you'll be notified when online registration goes live. Invite all your friends! Location, Bayard Rustin High School 351 W 18th St New York, NY 10011. This page was last modified on 23 February 2011, at 03:27.